I am so excited to share a Q & A with my friend, fellow author and fellow warrior Tegan Wren, author of Inconceivable! 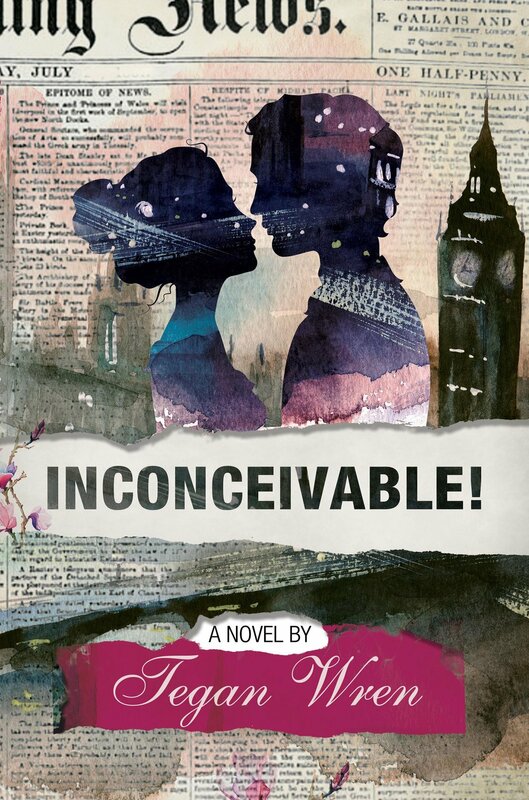 I was honored to receive an advance copy of Inconceivable! Even though I spend most of my reading time on nonfiction, memoir and therapy books, I gladly admit I could not put down this romantic novel with a heartbreakingly real infertility twist! I truly relished every word and stayed up late too many nights devouring the book. QUESTION: Inconceivable! seems to be the great combination of romance novel with a bit of education on infertility. What was it about the novel or even romance novel that pulled you in this direction? And why include the infertility struggle in it? ANSWER: I love to read novels because I think fictional stories are powerful tools for revealing truths. It's my hope that my novel will illuminate truths about the infertility struggle that those of us who live it have experienced. Through those truths, I want to raise awareness of infertility and increase compassion for people who experience it. As far as writing a romance...Most infertility stories unfold within the context of a romantic relationship. For me and my husband, it felt like infertility interrupted our "happily ever after." I think it's like that for a lot of couples. So, I wanted to have the reader invest in a couple's romantic relationship first before bringing in the infertility storyline. That's how it happens in real life: you're going along just fine with your significant other and then BOOM! You can't achieve this one thing that you both want so much, the thing that society says is the tangible proof that your relationship is valuable. You feel like such a failure. It's a deeply personal and painful medical challenge. QUESTION: What phrase in the book are you most proud of? ANSWER: This is a passage about Winter's Feast, a holiday that's celebrated in my book's fictional country. I wrote it to have a double meaning; it describes the hope you hold in your heart when you go through infertility. "In the scarcity of winter, may we celebrate our bounty. Winter’s Feast reminds us even though the land looks barren, the potential for life sleeps just below the surface." QUESTION: Did you write in the order it ended up being published in? ANSWER: No...This was my first novel, so I wrote several scenes out of order. In fact, the very scene I wrote is what became John's Epilogue. It's funny to think I wrote the ending first, but it was kind of neat because I always knew how my characters were going to end their story. Then, the challenge was choosing the beginning and filling in all the details for a complete and satisfying story. QUESTION: Was there a section you struggled the most with to write? ANSWER: I really struggled with a scene in which the main character grapples with loss. (I don't want to give any spoilers, so I'll just keep it kind of vague.) It was challenging to strike the right balance between dramatizing it and being too over-the-top in how I described her reaction. In the end, I was able to craft a scene that hits the right chord with the help of my amazing editor from Curiosity Quills Press. She also experienced infertility, and brought some excellent insights and recommendations to this particular scene. We really bonded over the process of editing my book. QUESTION: How did you start and finish writing the book? What are your favorite writing tools? ANSWER: I thought a lot about the story itself and my characters before I ever started writing. So, it began with plenty of brainstorming. There's no way to finish a book except to be disciplined enough to do it. You have to remember the first draft won't be perfect. But until you finish the first draft, you can't really revise, edit, and clean up your story. As for my favorite writing tools...I always write using my laptop. I love to have a coffee on hand. A thesaurus is a must. I use an online thesaurus to avoid too much repetition in word choice. QUESTION: What do you hope readers get out of Inconceivable!? ANSWER: I hope readers are entertained and enlightened. Fiction, at its best, does both. For readers who haven't experienced infertility, I hope they come away from the book with more compassion for people who struggle with this medical condition. One way to normalize a topic is to write stories about it and put those stories in books, in magazines, and in movies. I'd love to see more stories that give an accurate snapshot of what it's like to live through infertility For my sisters and brothers who have walked this lonely road, I hope they see hints of their own stories in these pages, and that it helps them know they are not alone. QUESTION: What other authors do you enjoy reading, look up to or learn the most from? ANSWER: I've learned a lot from reading talented writers like C.S. Lewis, Sena Jeter Naslund, Stephen King, and Anita Diamont. As you can see, my tastes are quite varied. I never really care what genre I'm reading. I just want to immerse myself in a great story. These writers do a magnificent job of weaving tales so engrossing that I lose track of time and stay up too late to finish a book! That's the kind of story I tried to write. QUESTION: How much of your story is in Hatty's? ANSWER: My personal journey inspired the infertility story in INCONCEIVABLE! Like Hatty, I had a chemical pregnancy, in utero inseminations, and an in vitro fertilization cycle. But the dynamics of Hatty and John's relationship are quite different from what my husband and I experienced. So, there are some similarities, but I took advantage of the liberties that come with writing a work of fiction. QUESTION: What is next for Hatty and John? ANSWER: I don't have firm plans to write a follow-up story about Hatty and John because I think they're in a really good place when their story ends. But I have the basic plot outline for a story about one of John's cousin and an American grad student. It's a romance, but does not touch on infertility. Instead, it's more about the secrets family keep, why they keep them, and whether it's worth hurting the people you love to reveal these secrets. I think those are all compelling issues that are ripe for exploration. QUESTION: What is next for you? ANSWER: I'm really focused on telling people about INCONCEIVABLE! Some days, I want to jump up on a roof with a megaphone and yell, "I have a new novel that deals with infertility! I think you'll enjoy it if you've experienced infertility or if someone you know has gone through it!" I've completed a second novel, though it's different in style, tone, and subject matter from INCONCEIVABLE. I'm doing some revisions on it in preparation to begin querying agents after the first of the year. In closing, I just want to thank you for reading my book, Justine, and for allowing me to share about my book and personal journey. To your wonderful readers: I love to connect with people who are in the infertility and/or adoption communities, so please get in touch!